Smartlipo Triplex® is a revolutionary procedure that uses Cynosure’s state-of-the-art Smartlipo Triplex® system for minimally invasive laser assisted liposuction. The laser energy is introduced into the fat through a tiny catheter placed under the skin. 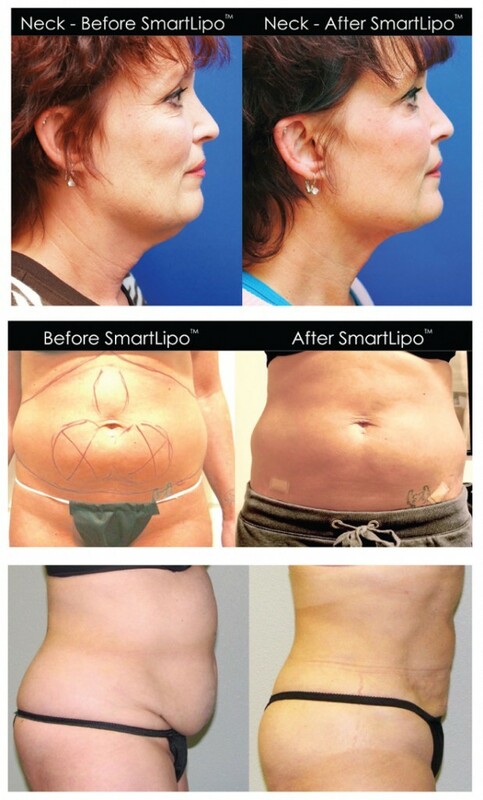 What does Smartlipo Triplex® do? Smartlipo Triplex® uses three different laser beams; one melts the fat, one tightens and thickens the skin, and one minimizes bruising. The ideal candidate is not substantially overweight. She or he will have deposits of unwanted fat that have been resistant to diet and exercise. Areas of the body that can be treated are the abdomen, outer or inner thighs, love handles, knees, arms, bra-line, waist or neck. The procedure is done in our office and patients experience little discomfort. One to three body areas can be treated during one procedure. The procedure is performed under local anesthesia and oral sedation is not necessary for most people. First, the area is numbed with a diluted lidocaine solution through a few tiny skin incisions. Next, a laser cannula is inserted into the fat through the same incisions to melt the fat and to tighten the skin. Finally, the treated fat is removed with a small suction tube. Who performs the Smartlipo Triplex® procedure? Dr. Shapira, a board-certified surgeon, will be performing this procedure. He has had over 25 years’ experience as a cardio-thoracic surgeon at Christiana Care Hospital in Newark, Delaware. The procedure generally is done at the end of the work week and most patients are back to their normal routine on Monday with no interruption. The treated areas tend to be swollen for several days. Local tenderness is treated with Tylenol and Motrin. How does Smartlipo Triplex® differ from traditional liposuction? Traditional liposuction uses a cannula and physical manipulation to suction fat from beneath the skin. SmartLipo Triplex® utilizes laser energy to liquefy the fat, making it easier to remove with the cannula, typically resulting in less bruising for the patient. Smartlipo Triplex® has an added benefit of tightening the skin. Liposuction alone or Coolsculpting do not provide any skin tightening and often they leave dimpling or sagging skin, particularly with older patients who have lost more of their skin’s elasticity. After traditional liposuction, a ‘tummy tuck’ is required to remove excess skin. Traditional liposuction requires a longer recovery time while SmartLipo Triplex® patients can return to their normal routine in a couple of days. Are the results of Smartlipo Triplex® permanent? Yes! The fat cells are removed permanently, therefore, if you gain weight after the procedure, it will not concentrate in areas that were treated. Although SmartLipo Triplex® removes the fat cells permanently, it will not prevent you from regaining weight. To keep your new shape and new weight after Smartlipo Triplex® you must live a healthy lifestyle with a proper diet and exercise plan. Next Story → SENIOR CARE NOTES: Do You Know Where Your Loved One Is?